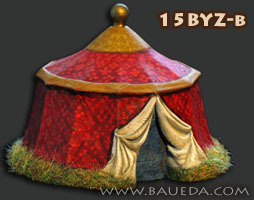 15mm Byzantine Tents AVAILABLE NOW! 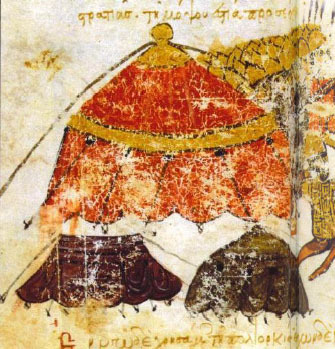 These Byzantine tents are based on the illuminated manuscript of the History of John Skylitzes (11th Century). They are designed to be used as a baggage element for any Byzantine army and to fit on a standard 40x40mm DBM baggage base or multiples of. 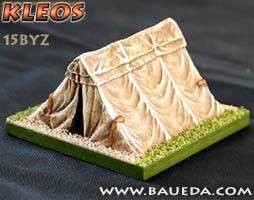 This ridge tent is a typical troop field accommodations as it was used in the Byzantine empire. The classical imperial Roman origin is quite evident. The model is about 33mm wide, 35mm deep and 21mm tall. 15BYZ is available in three finish: simple plain cast, as it comes out of the mold; cleaned and primed, based and ready to paint; or as a finished DBM baggage element, painted, based and flocked to the very same standard you see in the picture! 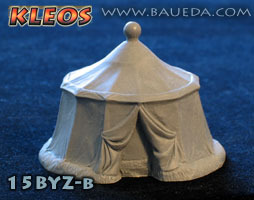 This round tent is a model of the commander field accommodation that would be used as Headquarters as well as the accommodation of the Emperor or a general and his bodyguards. It is clearly an ancestor of what will become the classical western medieval "bell" tent and has many similarities also with the field tents later used by Turkish armies. The model is about 64mm in diameter and 48mm tall therefore it would not fit on a 40x40mm single baggage base. 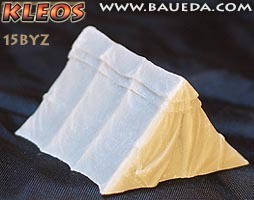 15BYZ-b is available in three finish: simple plain cast, as it comes out of the mold; cleaned and primed, based and ready to paint; or as a finished DBM baggage element, painted, based and flocked to the very same standard you see in the picture!